My daughter is cultivating a friendship with a few Stellar’s Jays. Like crows, these birds will gladly take advantage of food being left out for them. But they especially like peanuts in the shell. 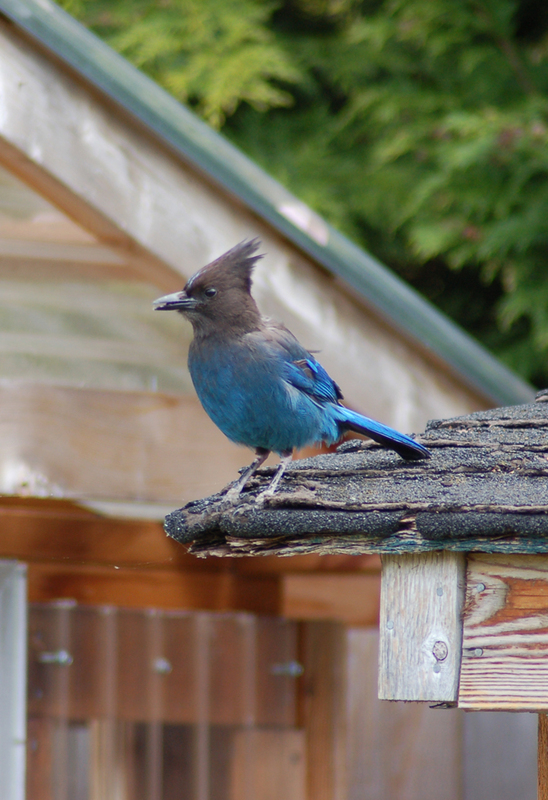 My husband’s family has always lived here in British Columbia where the Stellar’s Jay is the Provincial bird. In addition to having a native advantage, my Father in law is a prominent British Columbia birder with an impressive “life list”. So he knows a few tricks. There is one Jay that my husband has named “Scruffy”. He has a little twist in his head feathers that make him look a little disheveled. He is smaller than the rest and seems a little more needy for the peanuts. But no matter who comes in to grab them, the daily peanut ritual is quite entertaining. The idea is to put out a small amount of peanuts. (My daughter gets carried away thinking more is better.) If the peanut buffet sits out too long, the Crows barge in. The Jays make a terrible sound when a lone Crow is advancing, and can usually hold their ground. The Jays ability to imitate the cry of the Red Tailed Hawk doesn’t help them when they are facing off against a big Crow. If there are many peanuts to choose from, the Jays start to get a little choosey. They will pick up and put down several peanuts decided which one is the heaviest.